Everyone loves vintage décor which always looks beautiful no matter how the world keeps moving on. Up until today, lots of homeowners still choose this kind of look to beautify their beloved home. One of the decoration themes which is inspired by the beauty of old times is shabby chic. Some of you may be familiar with this theme since it becomes popular again recently. Shabby chic is all about decorating a room with vintage or rustic furniture, accessories, décor items but in a more stylish nuance. 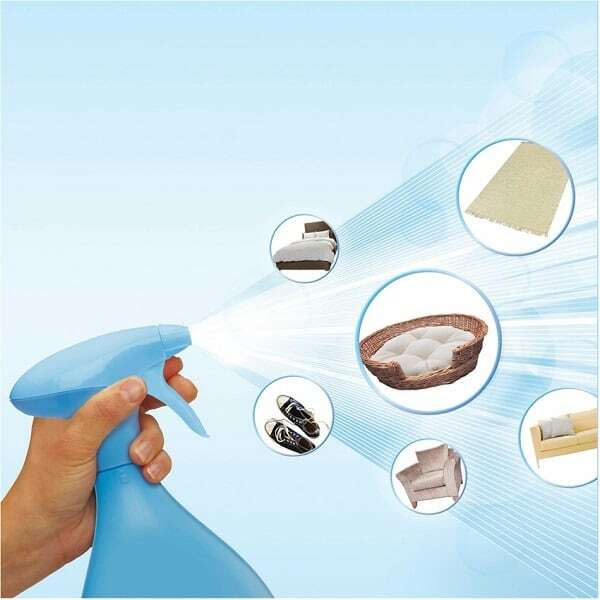 It’s applicable in almost every single room in a house like the living room, bedroom, and even bathroom. 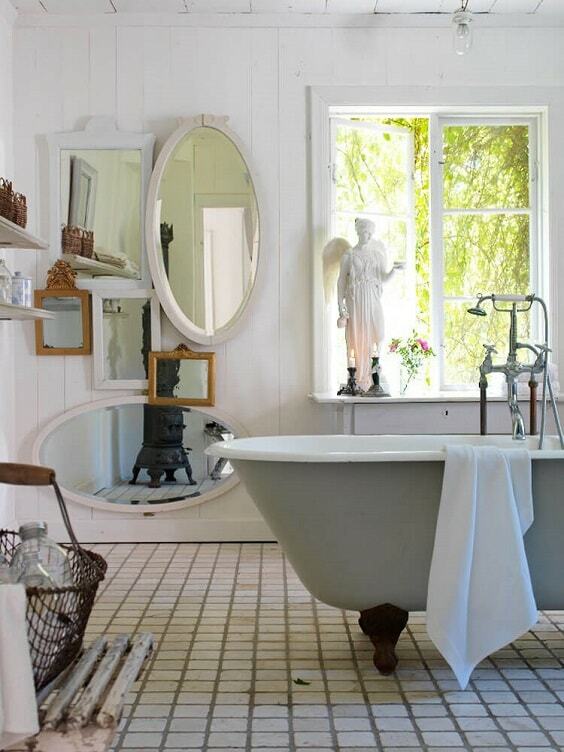 Here, we have picked lots of shabby chic bathroom ideas that will surely inspire you to have one. They look so admirable and feel comfortable at the same time which makes them so worth to be your ultimate reference. 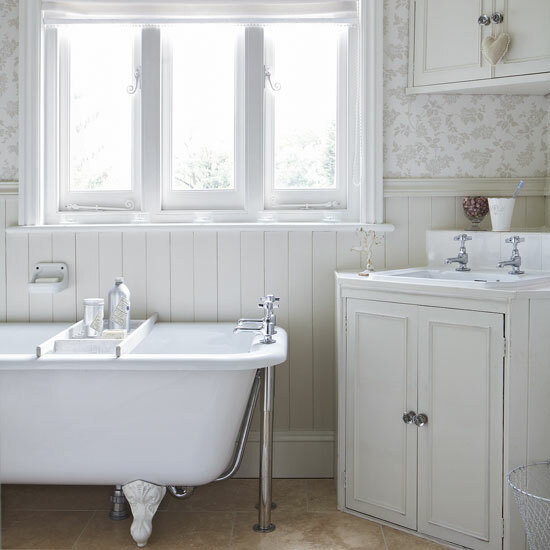 So let’s just keep scrolling to check out our best shabby chic bathroom ideas! One of the characteristics of a shabby chic decor is a lot of drapes which makes it look decorative, and here, the vibrant drape in the floral print is used. 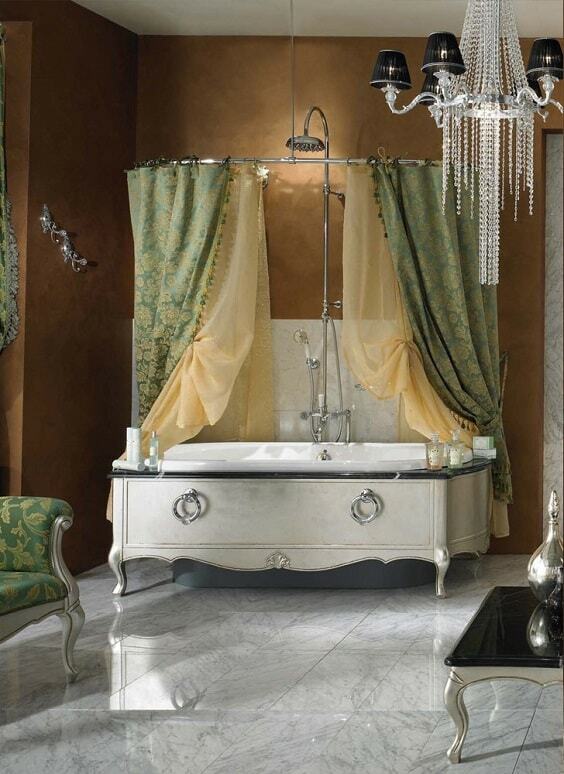 It creates a more glamorous nuance when it’s combined with the golden crystal chandelier and lux bathtub. 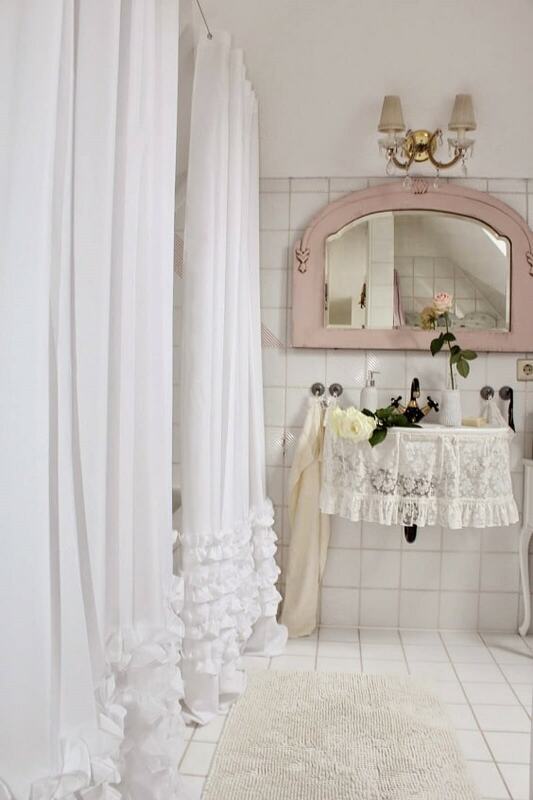 Again, the drapes are made as the focal point in this shabby chic bathroom, and this one is designed in ruffle style. To colorize the room, a classic pastel pink mirror is placed above the sink which is also decorated with the ruffle cloth. 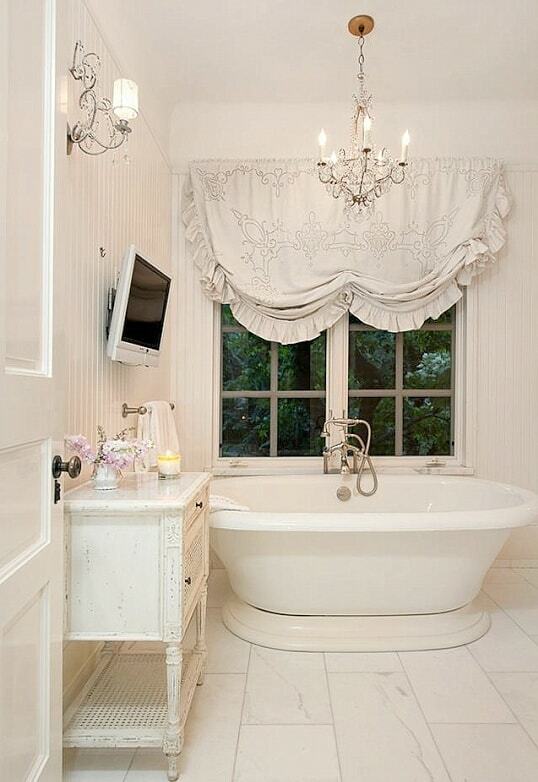 An all-white décor is surely everyone’s favorite, and you can apply such look for your shabby chic bathroom. This idea shows a beautiful combination all-white nuance with the rustic touch which makes it look gorgeously vintage. The distressed furniture is a perfect piece that you can always add to a shabby chic decoration which will create a superb vintage touch. 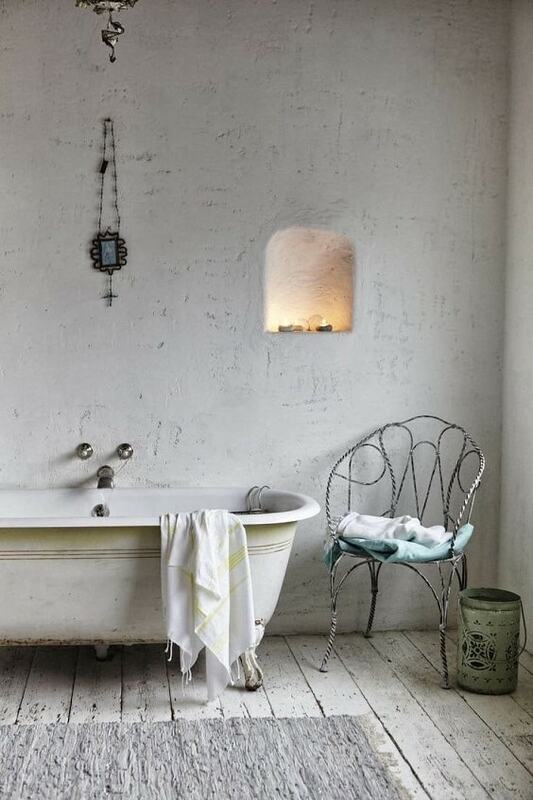 This shabby chic bathroom is colorized with beige which creates a warm atmosphere beautifully. 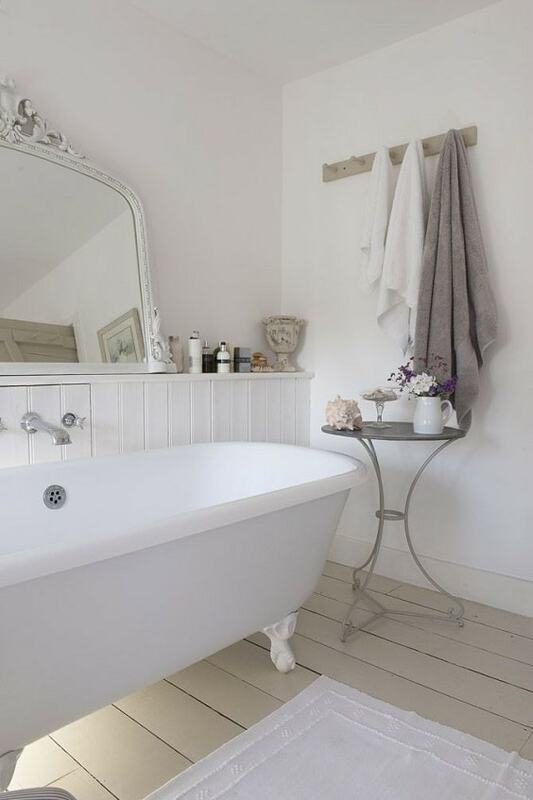 A bathtub with pedestal legs can be an easy bathroom stuff to become a major focal point of a shabby chic bathroom just like this idea shows. 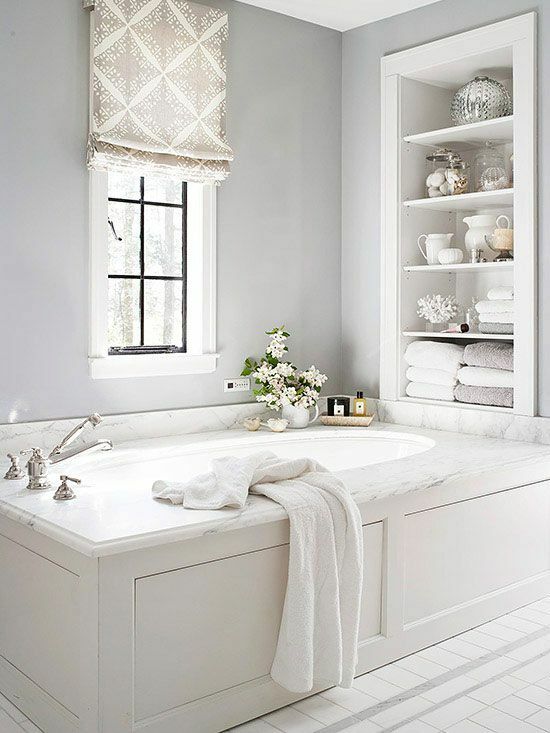 The bathroom has a gorgeous combination of an all-white and earthy nuance which is so inspiring to copy. 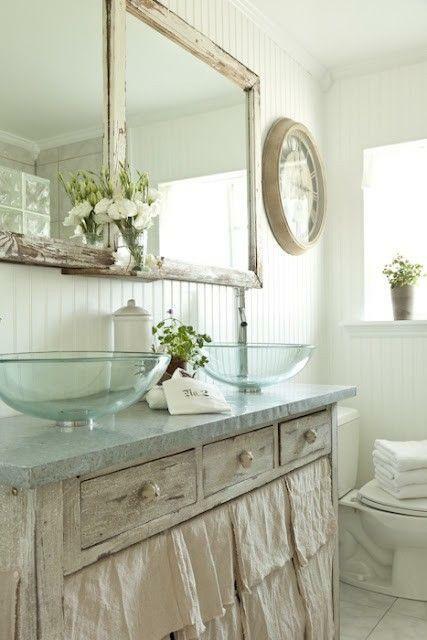 If you want to have a shabby chic bathroom with the superb distressed décor, this idea can be the best option for you. The room is dominated by the wood walls in a distressed finish and some rustically vintage pieces also decorate the room very well. 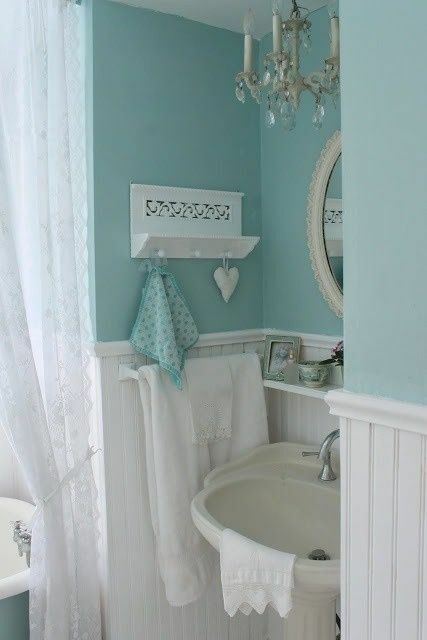 Blue is always the perfect color option to colorize a bathroom and you can apply it to create a shabby chic decor. This bathroom combines the icy blue wall with the white wood panel which gives it a stylish classic vibe perfectly. 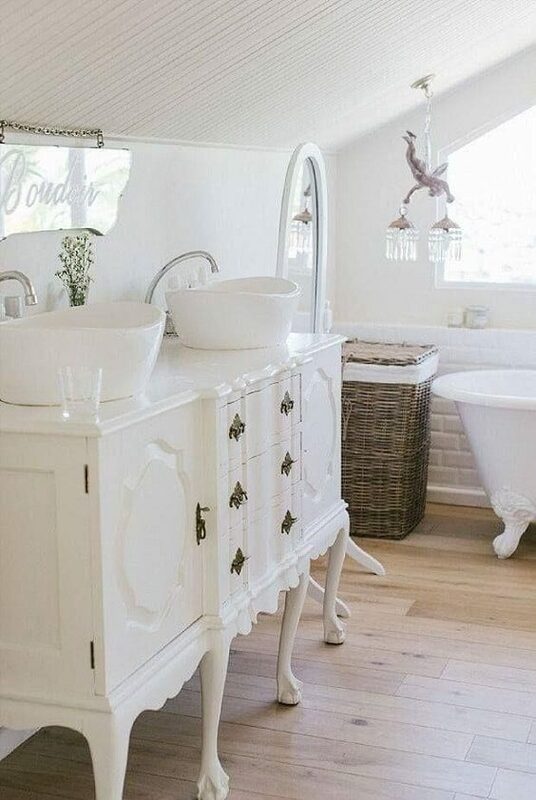 Another inspiring shabby chic bathroom for an all-white décor lover and this one is colorized by the whitewashed wooden flooring. 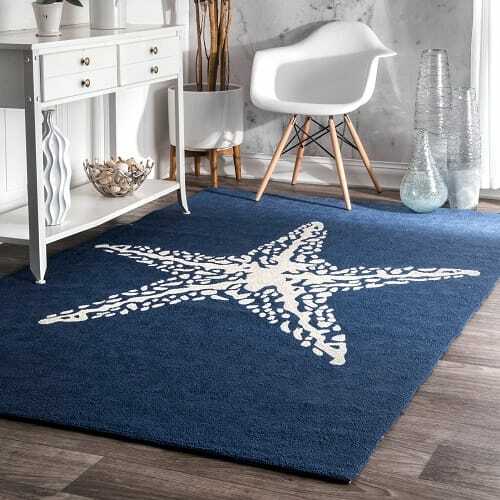 It gives the room a nice rustic look which keeps its soothing characteristic. 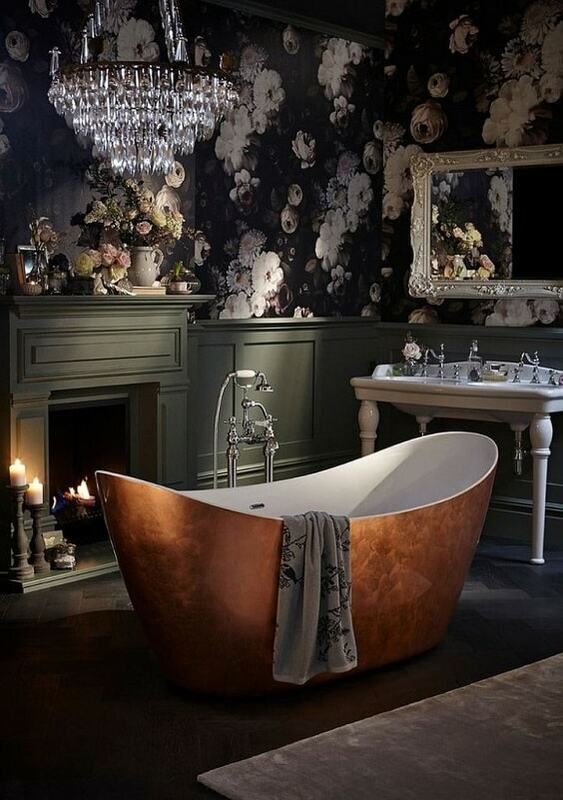 The beautifully festive bathroom with the floral wallpaper and its beige walls make it feel warmly inviting. 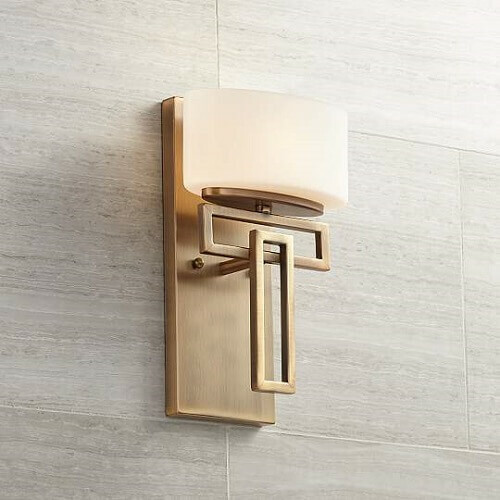 To make a glamorous touch, the classic crystal chandelier and golden fixtures are installed perfectly. Yeap, the floral wallpaper can always be a considerable element to make a shabby chic living room look decorative. 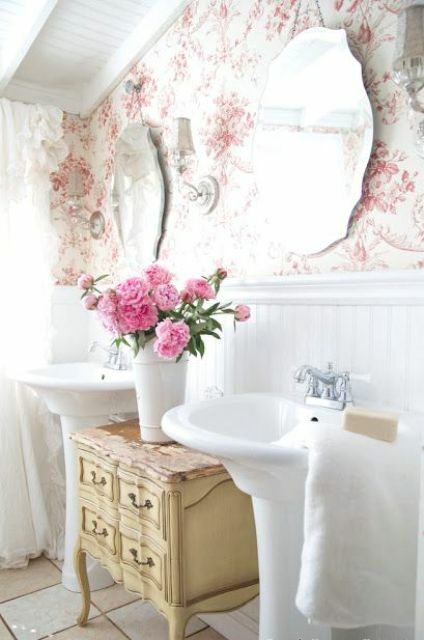 Here, the white floral wallpaper is chosen to decorate a bathroom alongside those white furniture and fixtures. 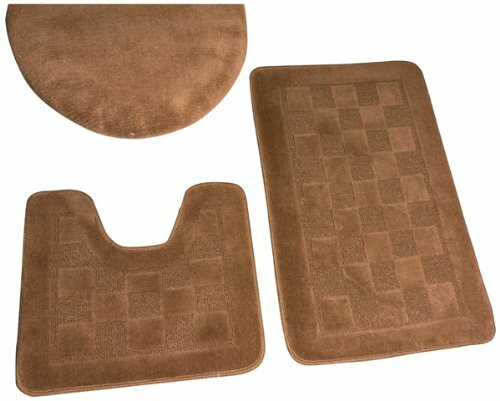 Furthermore, the rustic brown tile colorizes the room while still keeps its vintage vibe. 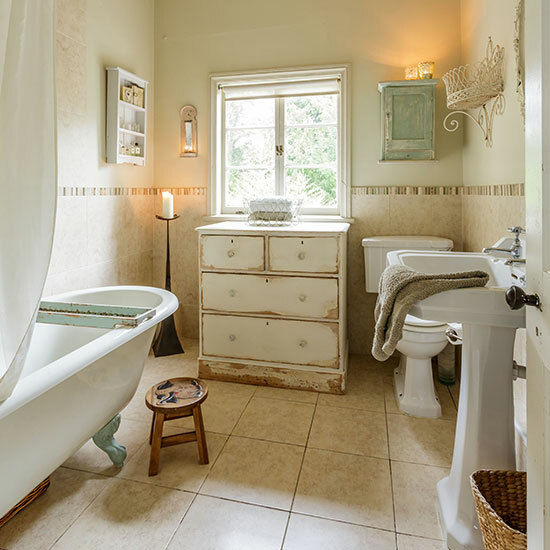 The adorable bathroom with a soothing combination of shades of green and white. It looks calmingly decorative with the subway tile which covers all the walls of the room. As you may have noticed, the antique window which works as the divider in this shabby chic bathroom is made for its focal point that you can try to copy. The weathered vanity and chequered flooring then emphasize the more classic touch around. For sure, the Victorian style furniture and fixture will are the perfect choice to create a shabby chic bathroom in a very glamorous way. Here, the bathtub, chair, table, and chandelier are designed in the Victorian style which makes it look as stunning as possible. 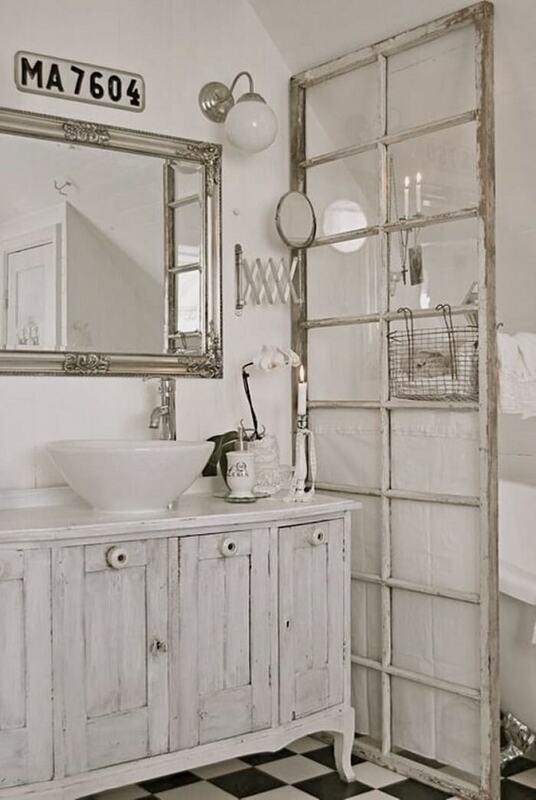 The fresh shabby chic bathroom with an all-white overall look that you have to include on your inspiration list. You can see how the floral tile is used for the flooring of the room which makes it look decoratively pretty. 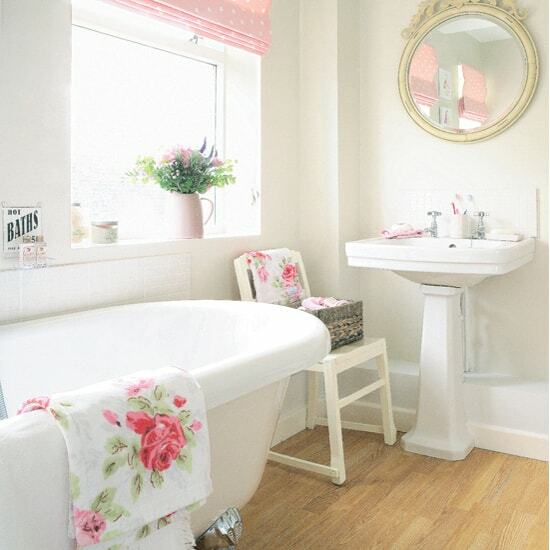 This one is a lovely shabby chic bathroom for you who are looking for a feminine layout. The floral accessories, pink element, and pretty décor items style up the room gorgeously. The superb antique cupboard is definitely the focal point of the room which brings the shabby chic vibe perfectly. 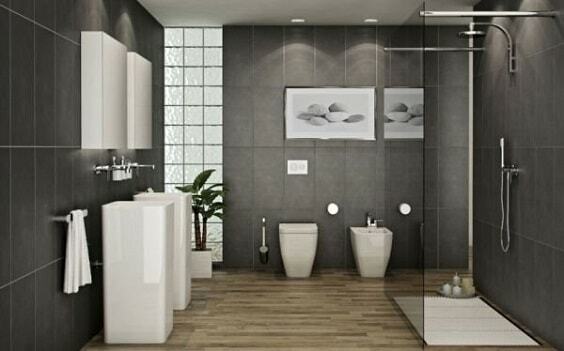 Then, the checkered flooring and pedestal bathtub complements it very well. With the soft grey wall, this shabby chic bathroom looks soothingly beautiful which can be a good choice for you who love the neutral layout. The washed wood flooring then colorizes the room and gives a more natural vibe at the same time. 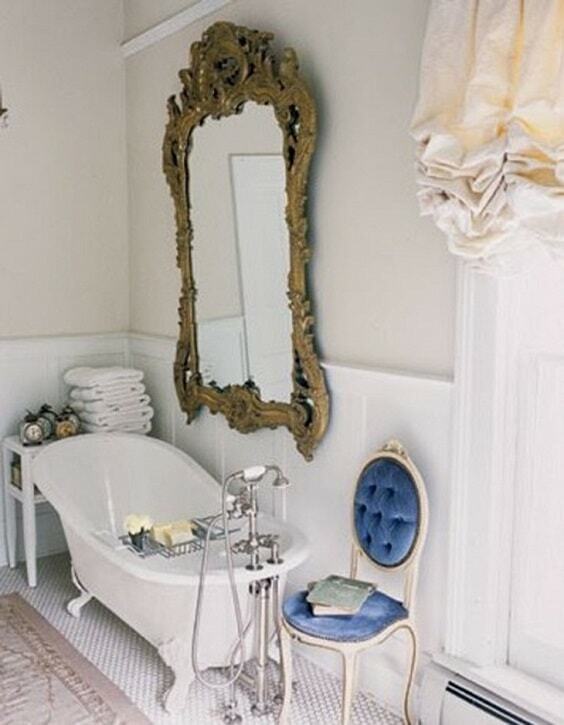 French-style furniture always gives a classically glamorous touch that makes it so applicable for a shabby chic bathroom. This idea chooses a French-style vanity as its main focal point alongside those claw-foot hot tub and vintage chandelier. 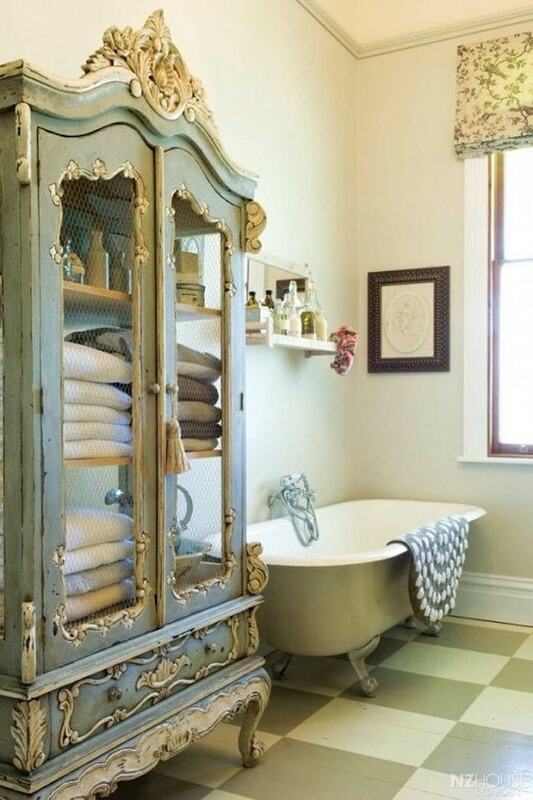 This bathroom is filled with lots of classic furniture and fixture which makes it look so tempting to copy. It can be a good inspiration for you who want a simpler decoration which is so easy to try. 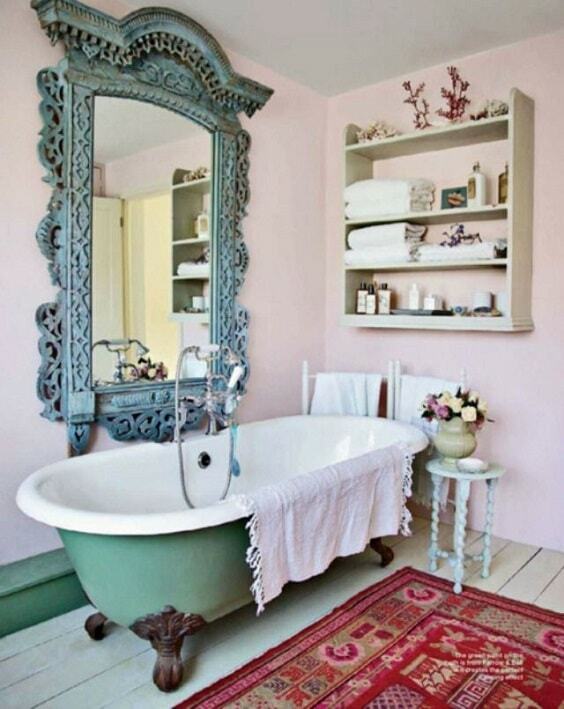 The unique shabby chic bathroom which is inspired by the ancient vibe that everyone will love. Its concrete walls in the rustic finish make it look distinctively classic. 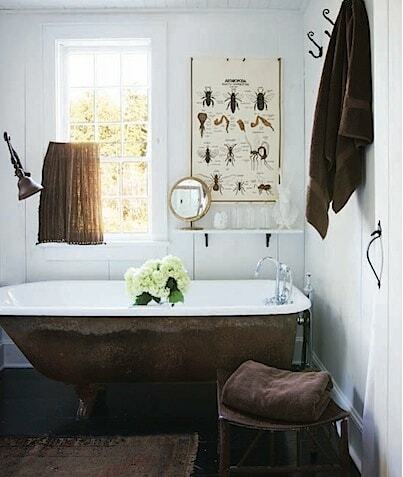 The elegant combination of brown and white of this bathroom looks so inspiring to try. It’s such a good way to colorize an all-white bathroom. 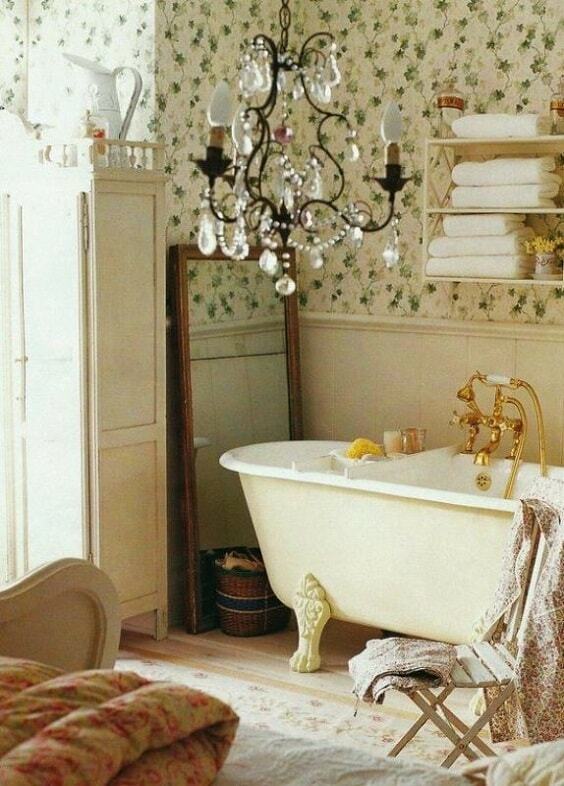 The brightly beautiful shabby chic bathroom which is dominated by the soft yellow. Then, the distressed touches are added to emphasize the vintage nuance all over the room. The captivating all-white bathroom with the shabby chic layout which looks calmingly decorative with its furniture and accessories choices. All sides of the wall are covered with the wood panel to give a more textured look. Then, the decorative drapes, distressed vanity, and marble flooring give a beautiful harmonious nuance to the room’s overall look. 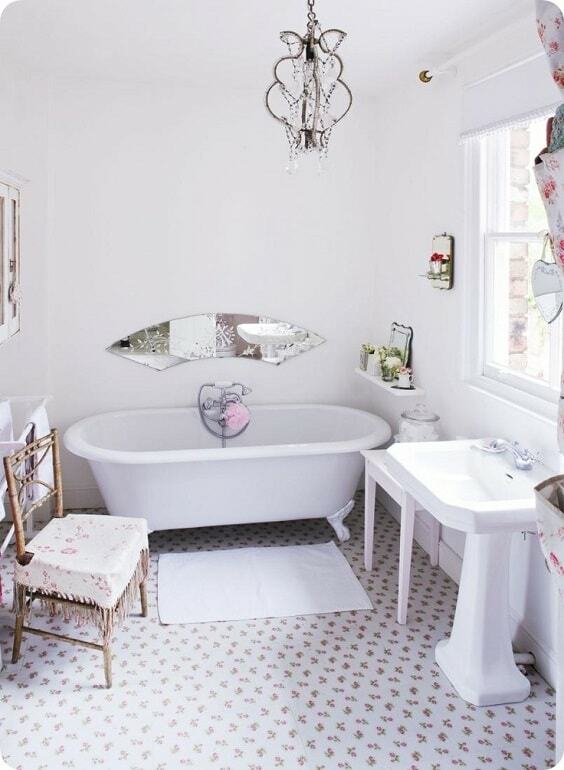 Another shabby chic bathroom with the floral wallpaper for you who love the feminine layout, and it looks so beautiful with its pink and white overall look. The yellow vintage bedroom dresser then becomes a standout element which makes the room look more decorative. 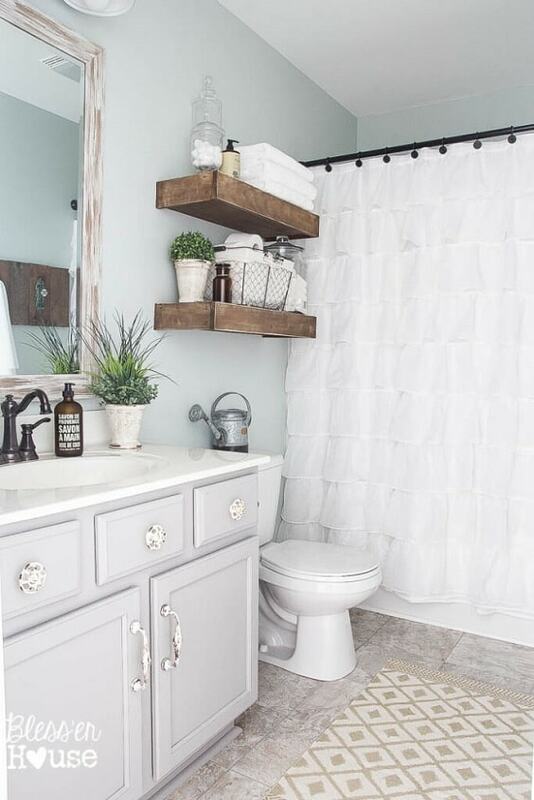 The simply gorgeous shabby chic bathroom with the combination of white and grey which creates a nice neutral atmosphere. Then, the classic window gives a classic touch which styles up the room beautifully. 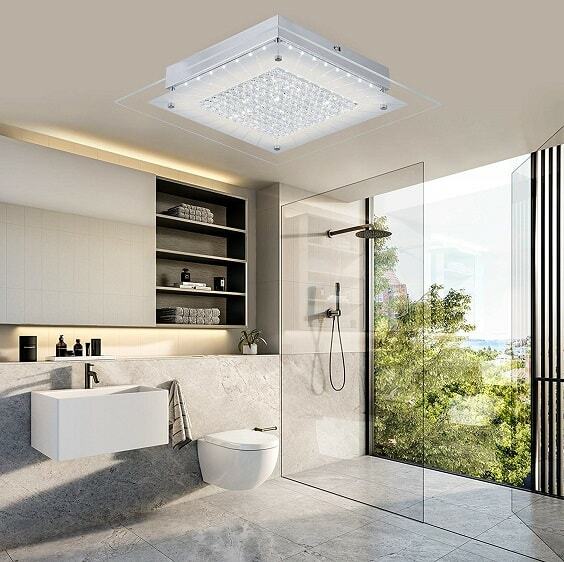 Basically, this one is an all-white bathroom which is decorated with the neutral fixture and accessories. 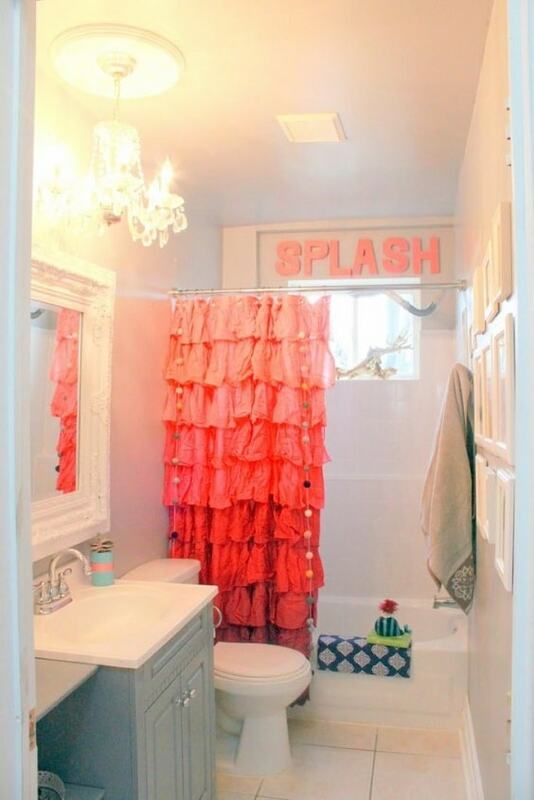 Then, the vibrant red shower curtain is installed which makes its décor looks much catchier. 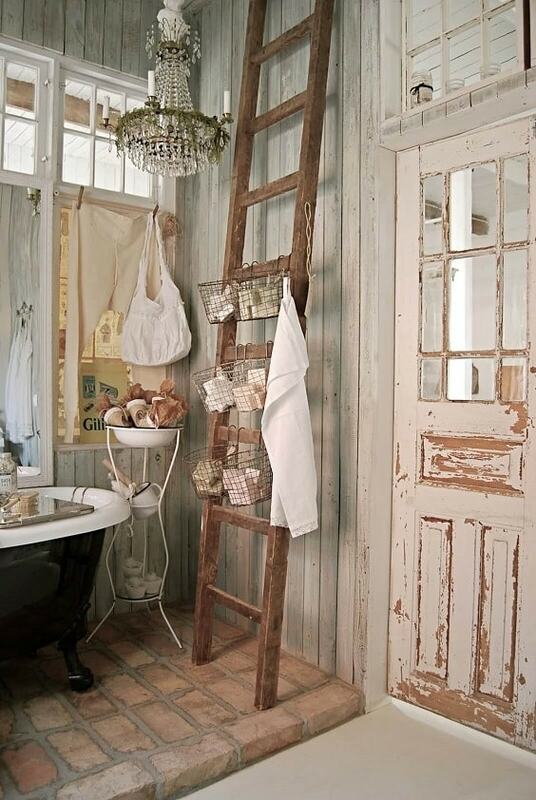 This shabby chic bathroom shows how to mix the modern and vintage element gorgeously. 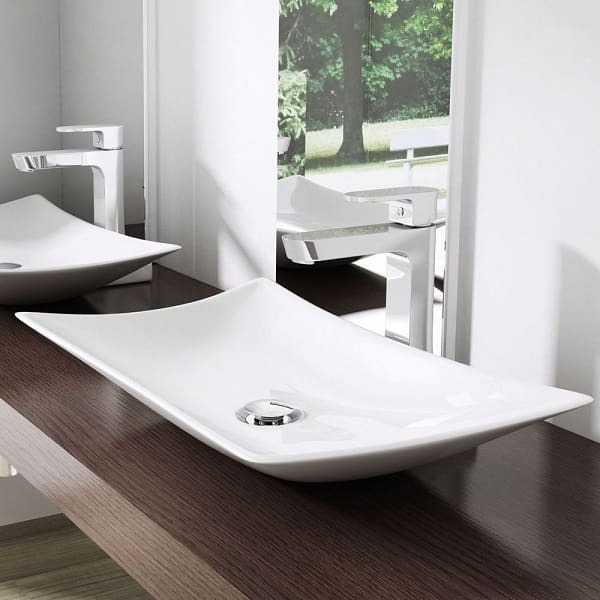 All of the bathroom fixtures and furniture complement each other which create a mesmerizing layout to copy. For you who want to have a floral bathroom yet with a more elegant look, this shabby chic bathroom can be a great inspiration. The entire wall is covered with the black and white floral wallpaper which gives a bold decorative nuance. 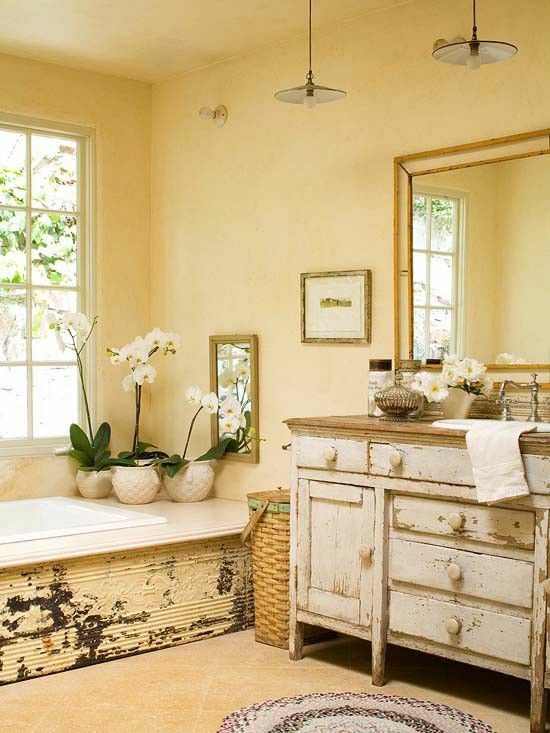 Well, those are some mesmerizing inspirations of the shabby chic bathroom that you can use as your ultimate reference. They beautifully combine the elements and colors which create a tempting decoration for you to try. Choosing the shabby chic theme is always a good idea since it’s such a timeless decoration which always looks beautiful from time to time. Moreover, the shabby chic décor always gives such an inviting atmosphere that will make your bathroom feel more exhilarating to use. 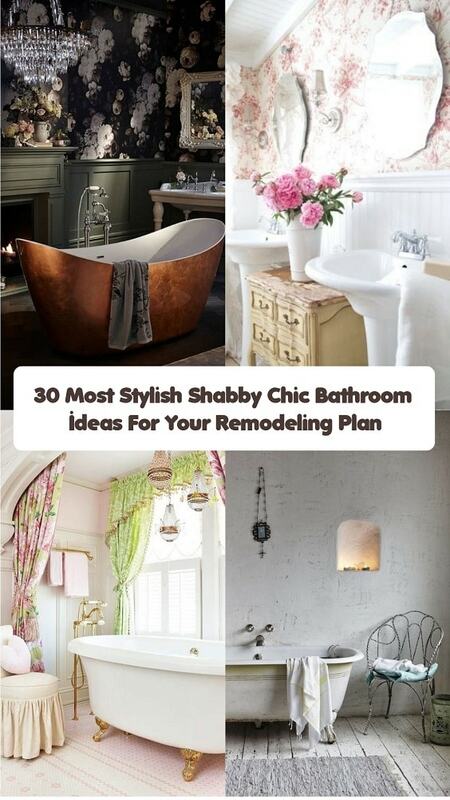 And now, it’s your turn to choose the best shabby chic bathroom that suits your needs and taste. 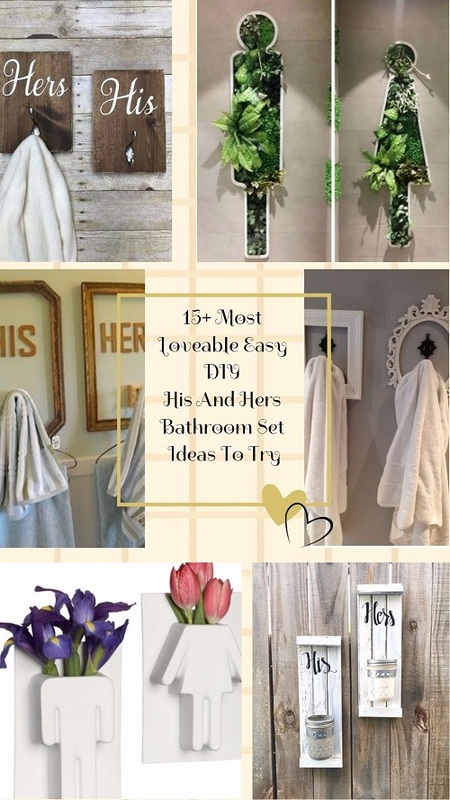 Also, keep in mind to always create a nice harmonious look if you want to apply the shabby chic décor to the existing layout of your bathroom. 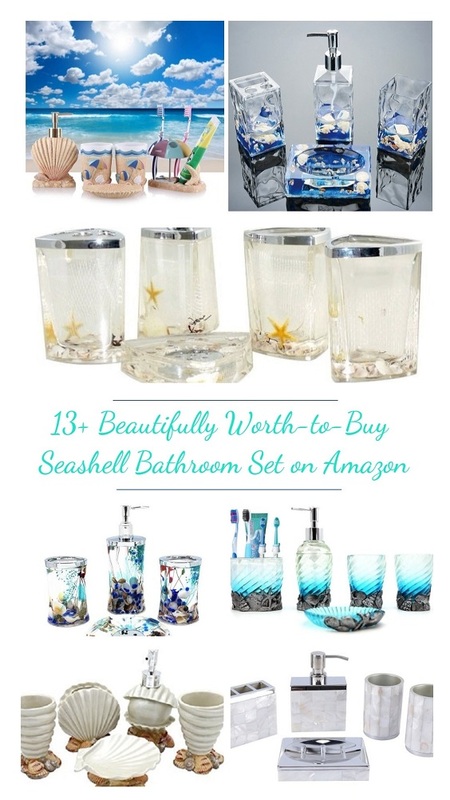 Happy decorating your very own bathroom with the shabby chic style then!